Former England rugby union centre Luther Burrell will switch codes to join Super League side Warrington Wolves after leaving Northampton Saints. Burrell, 31, will join the Wire from Saints on 1 July in a deal until 2021. He won 15 caps for England and has made 158 appearances for Saints since joining from Sale Sharks in 2012. "I'm buzzing to get involved with rugby league and the Super League," said Burrell. "I've had some great times in rugby union, and I've had some adverse times, so for me to have this opportunity to play rugby league and see how far I can get with a great team is exciting." 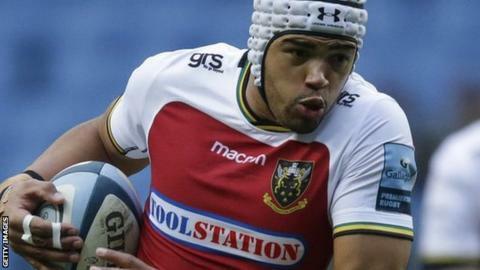 Burrell said he is "firmly focused" on a successful end to the season with Northampton. He is in his seventh season at the Premiership club, having helped them win the Premiership and European Challenge Cup in 2014. "It's exciting for Luther to be able to switch codes and to challenge himself in the Super League," said Warrington head coach Steve Price. "He's had an interest in the game of rugby league from a young age, and is a great coup for our club." Northampton defence coach Alan Dickens said: "I know how difficult a decision this has been for Luther and we are sorry to be saying goodbye to a player of his calibre and experience."